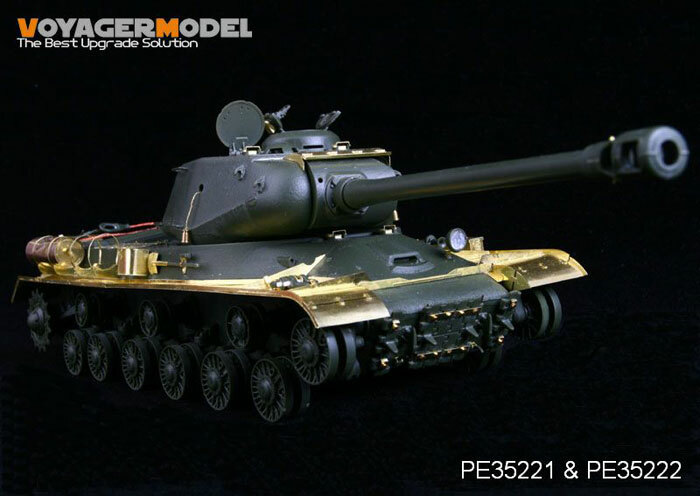 PE35221: Russian JS-2 Basic Tank update (for the Tamiya kit 35289) . Photo etch, turned brass, resin, wire and plastic Rod. 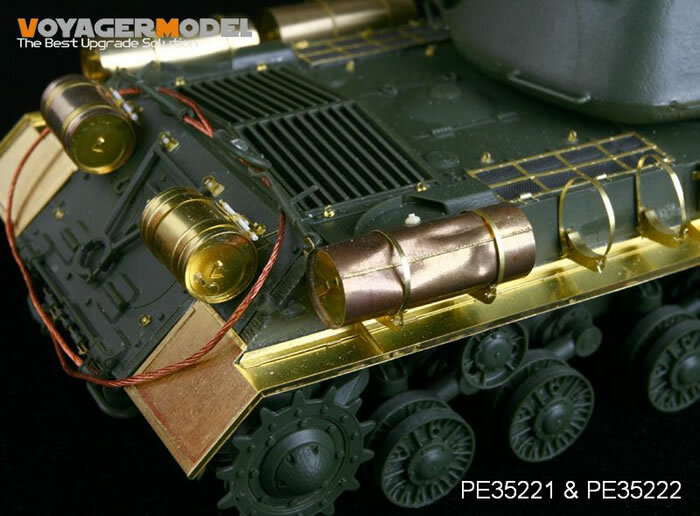 PE35222: Russian JS-2 Tank Fenders (for the Tamiya kit). Photo etch and Plastic Rod. 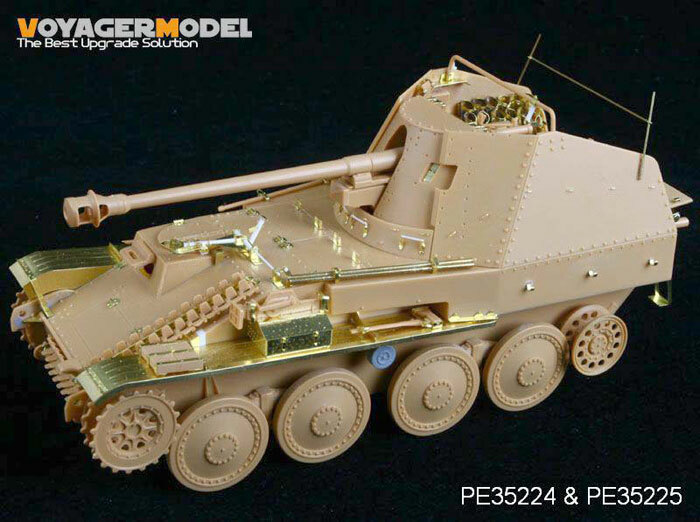 PE35223: US M5A1 Early update (for the AFV Club Kit 35105). Photo etch, Resin, and plastic rod. 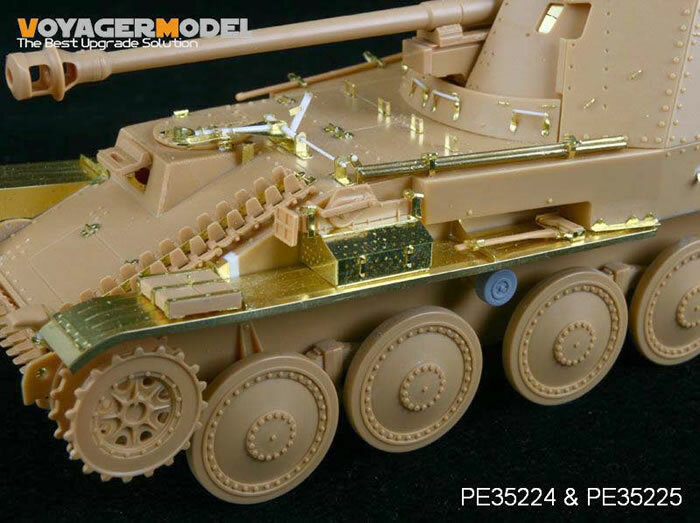 PE35224: German Marder III Ausf.M Basic upgrade (for the Tamiya kit 35255) Photo etch, turned brass, resin, wire and plastic Rod. Advantages: Price, complete nature of the product, first class instructions quality and availability. 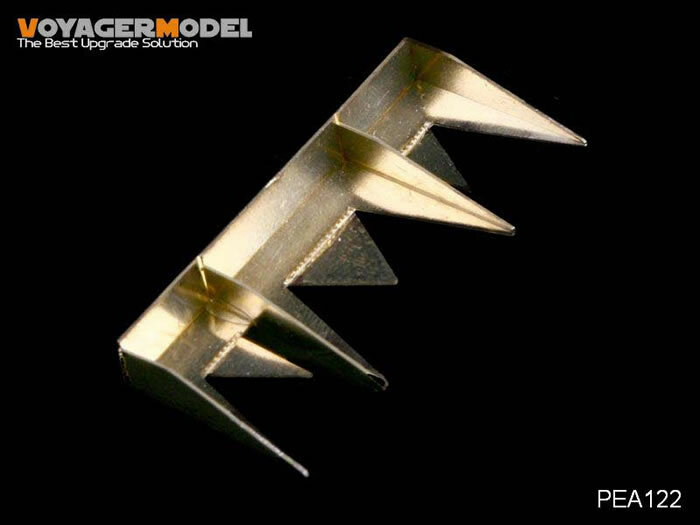 Voyager Models have added a few more updates to their range. I have grouped 6 of their latest photo etch and turned brass accessory sets for this review. the rear engine screens (these are some of the finest screens, I have ever seen in this scale). 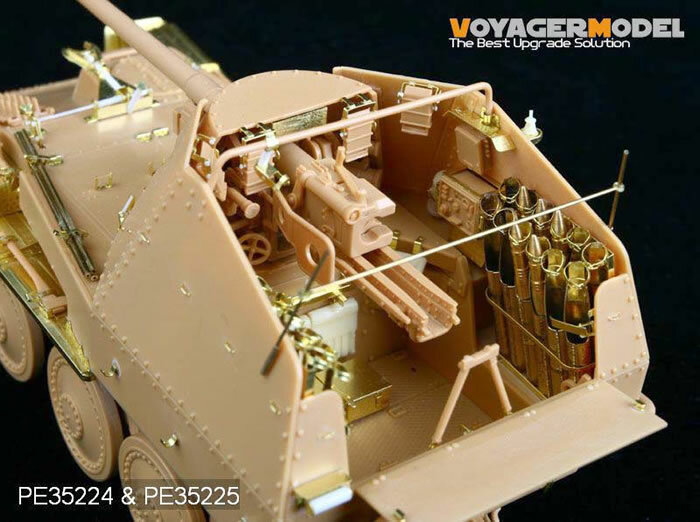 Also included are the tool racks, side mounted fighting compartment bins, barrel, tool clasps, external drop tanks and their fittings and some 24 finely turned brass nuts for the rear of the hull. Two clear resin head light lens are included and while a little cloudy, are very well cast and fit well to the kit parts. There are some definite advantages over the kit parts if you choose to use this set. The bend marks are clearly defined and all of the etch set and resin parts are usable (which is kind of rare.) I can easily recommend this set as it ticks all the right boxes and is a worth while update. This set is an update for the AFV Club Kit and covers 4 photo etch frets together with 2 resin pieces, 2 lengths of wire, and 1 length of soft copper tow rope. The very well illustrated instructions cover 51 construction sequences and cover most of the external fittings. The main parts covered are the front mud guards, headlight guards (with a cleaver guard template) engine grill replacements, tow mount, tow rope and their fittings. Also included are the tool mounts, leather strap mounts, visor mounts, and the hull and turret grab handles. The turret side mounted grouser holders are included (which are made up of 4 parts for each fitting). The commander’s 30cal weapon is included with etch provided for the barrel, mount and its ammunition box. The last part of this set is a resin upgrade for a hedge grove cutter and includes some very well done weld marks on the adjacent surfaces. While this set is not a comprehensive upgrade; it is very well done. 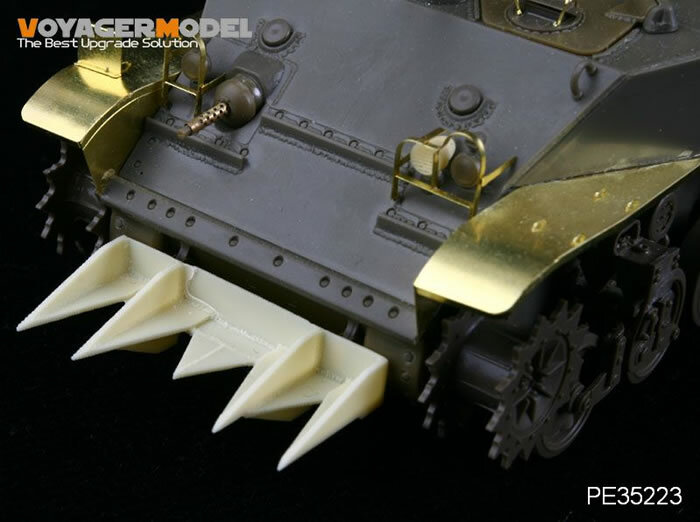 And to be honest is really all that is needed to upgrade the excellent AFV Club kit. This set is a companion to the last set reviewed and includes two photo etch frets to make up 36 Grousers often seen on the M3/M5 and M8 series of US light tanks. Each Grouser is made up of 6 photo etch parts and a small piece of plastic rod. The finished product has a certain finesse that can only be achieved with this photo etch medium and when fitted really lifts the detail level a notch. 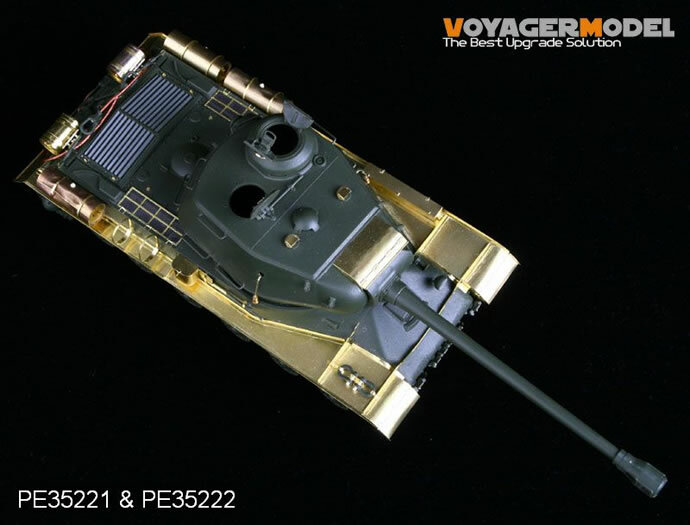 This set is an update for the Tamiya kit 35255 and again is labelled “basic” but as I have come to expect from Voyager it is” a little mis leading. What this company labels as “basic” would be considered “comprehensive” by many others. This set covers 7 photo etch frets together with 12 resin pieces, 2 lengths of cooper tube ,2 turned brass shells and 2 lengths of plastic rod. The three well laid out instructions sheets cover 103 construction sequences! which covers most of the detail in the fighting compartment and hull exterior. The main parts covered for the fighting compartment are the shell stowage containers (which are a weak point in the Tamiya kit), fuse draws, seat mounts, radio rack, visor mounts and various mounting hardware (often seen in period photos of the interior of this vehicle). The external fittings include all the grab handles, muffler guard, tool clasps, track holders, hinges, fighting compartment step, perforated tool box and a fire extinguisher upgrade. The brass it self is first class and the bend marks clearly defined. I must say this set has a number of advantages over the Tamiya kit parts. 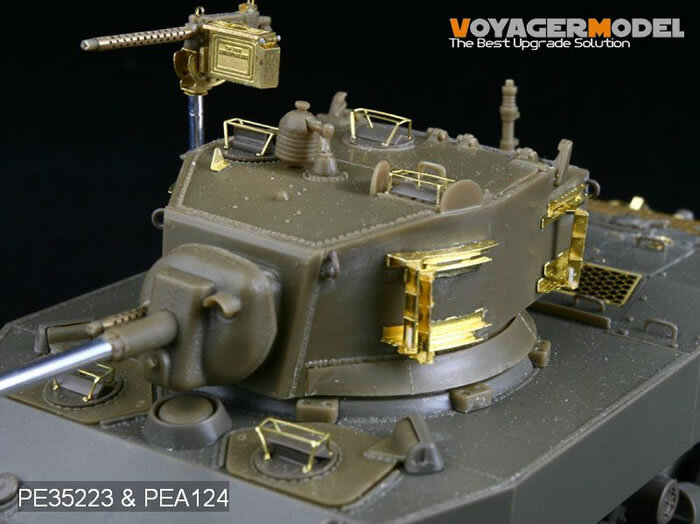 The quality of the brass and its overall presentation is first class and I have no hesitation in recommending this set to anyone who wants to update the Tamiya kit not to mention the soon to be released Tri-Star and the (me too) Dragon kit. 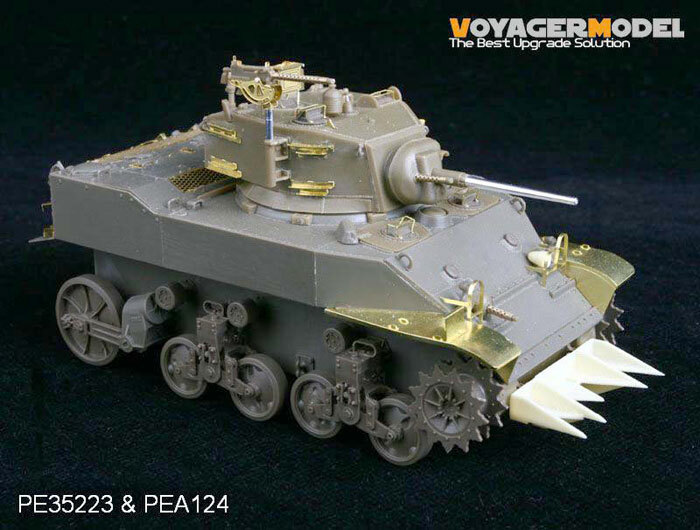 As the name implies this set replaces the Tamiya kit parts with photo etch items and consists of 1 photo etch fret. The advantage of this sort of set is it can be “battle damaged” and bent in a very realistic way. The added bonus is the brass is of “scale thickness” which can only be a good thing. The prominent ridges and rivets have to be embossed with the aid of a ball point pen and add to the finesse of this set. The instructions are both clearly illustrated and concise. I have no hesitation in recommending this set.